Nowadays, every woman who gives thoughtful preparation to her wardrobe includes a variety of knitted or crocheted garments, because of their artistic beauty and their comforting warmth. Wherever women meet, the art of knitting and crocheting is discussed–the newest garments, the best stitches, the prettiest colors. Many have recently been converted to the charm of this work, realizing that machine made garments do not equal in softness, beauty, and distinctive elegance, those made by hand, and that, therefore, the time spent in knitting and crocheting is both pleasant and profitable. Pleasant and profitable. That goes right to the heart of why I fell in love with knitting. Pleasant, in the sense that needlework steadies me sufficiently to keep me out of the Police Blotter. Profitable, in the sense that after the pleasure fades I am left with something tangible and (amigurumi and novelty fruit handbags aside) useful in exchange for my time. The longer I'm at it, though, the less I find I care about the tangible outcome. I had been knitting for years before I learned about gauges and swatching; once I learned about them, it was another few years before I learned to care. I didn't want to swatch for the thing, I wanted to make the thing. A rogues gallery of the elephantine and miniscule hats that followed would be shown here as evidence, if said evidence had not been destroyed. After the fifth gift hat a friend refuses to wear because she could easily fit her own head and those of both her children inside, you start to get the message: Swatch. Swatch, and learn something. Nowadays I love practicing, experimenting, playing with process. When I get the "What's that you're making?" question, about half the time the true answer is "Nothing in particular." But that draws puzzled looks and prolongs the conversation, so usually I just say it's a scarf. 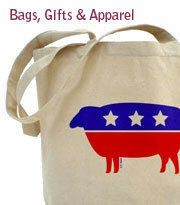 Non-knitters are satisfied, since they can't tell the difference and don't really care. Knitters glaze over at the word "scarf" and will happily change the subject, which allows me to go back to swatching. A new-to-me technique is my favorite thing to swatch. Recently I sat down with a book that's been on my worktable in the "PLAY WITH THIS" pile for ages, Alasdair Post-Quinn's Extreme Double-Knitting: New Adventures in Reversible Colorwork. Full disclosure: I saw the book before it came out, and liked it. I liked it so much that there's a quote from me on the back cover, saying so. But this was the first time I really sat down and threw myself into working from it. I'd played with two-color double-knitting before; but it was of the slip-this-side-then-slip-that-side variety and I found the process tedious and the results unsatisfactory. I like Alasdair's method, though. You get a firm, handsome, dense fabric with it. And when I say dense, I mean dense enough to wear as a winter hat in Chicago when you are a bald male of Mediterranean and Middle Eastern descent and therefore are genetically designed to crumple at the first blast of January wind from Canada. 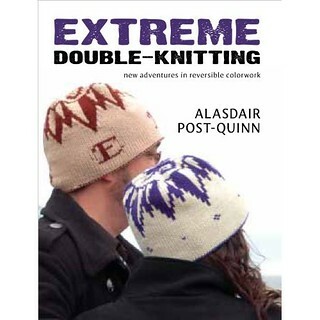 Alasdair takes "Extreme"–a sadly overused word these days, often denoting either a modest level of skill or an immodest level of bad taste–seriously. His basic method in two colors is a bit of challenge to begin with; but he blows past two-color reversible patterns into working it in the round, shaping it, adding extra colors, working different patterns on opposite sides of the same fabric, double-knitting cables and other textures, and building three-dimensional double-knitted objects. He would probably have zoomed onward into metaphysical double-knitting that alters the time-space continuum if the editor had not at last told him to Put a Lid on It. I waded into the shallow end with a wrist warmer. The design in the book is cute–a pair of opposing spirals–but as usual I had to get funky and Make It My Own so I adapted a pair of charts from a book I bought at the university bookshop in Reykavik. One is either a flower or a snowflake. The other is a dragon, a griffin, and a Boston Terrier all at the same time. The result–worked in DK leftovers from my stash–was fun to knit. It's a real charge to flip your work inside-out and see the same pattern with the colors reversed. This was fun enough that I know I'll take another crack at it, albeit with smaller needles. Alasdair urges you to work at a tightish gauge, and he's right. This specimen, worked with a size 4, would benefit from sliding down to size 2. My wristlet looks more than a little frowsy and is much too big for my wrist, yet I keep getting compliments on it at the coffee shop. Yeah. Cup sleeve. I know I said it was going to be a scarf, but I really meant to say cup sleeve. Swatch or cup cuff, it's lovely! The idea of metaphysical knitting that would alter the space time continuum had me do a dry-run spit-take. Hilarious as always, sir. Of course you could probably start on that road with a double-knit moebius scarf... perhaps with entrelac thrown in. I bought that book as soon as it came out, after I saw the handbag in a magazine and was saddened to learn it wasn't available. However, after having read through it twice, I have yet to gather the courage to try anything. Yup, front and back of a full deck of cards, in a sock-weight yarn scarf. "Pleasant, in the sense that needlework steadies me sufficiently to keep me out of the Police Blotter." This forces the question: Why haven't you taught that ovine roomie of yours how to knit?? If she can pick up a martini glass by the stem, she can hold knitting needles. And if the strippers at The Lucky Horseshoe can keep her attention, knitting can do so as well. And she may find it profitable, knitting g-strings for her favorite strippers. . .maybe, just maybe, the income will cover her bar tab. Someday I'll learn to give a rip about swatches. Right now, I want to make things. Honestly, a lot of the stuff I make doesn't require swatching (scarves, shawls, blankets) but I know I need to learn how to do it properly (with washing and everything). It may have saved me from ripping out a good chunk of a sock because it was too tight because I didn't do a gauge swatch first. Great cup sleeve! Alasdair's book is amazing. I was thinking about possibly removing the "must swatch this" page from an upcoming double knitting pattern, but you've convinced me to keep it. I LOVE it when a swatch turns into SOMETHING!!! I once double-knit a scarf...crickets...I gotta do more with this amazing technique. When non-knitters ask me what my swatch is, I say "Oh, I'm just experimenting" and they seem satisfied with that. I've used the double knitting technique to make a reversible Om symbol as a coffee cozy. It is definitely more work to make something that is directional reversible, but so worth it. You'd be pleased (or maybe alarmed) to know that Alasdair has been showing off at the knitter's brunch both double knit entrelac and double knit cables. 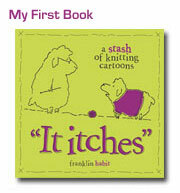 Franklin, thanks for plugging my book and I hope you keep up the double-knitting! I'll look forward to seeing what you come out with. By any chance, have you found references to this technique or anything similar in your copious amounts of historical knitting material? geez, i'm so glad you posted this because i have a whole wool blanket to knit with this technique and i needed a good dose of inspiration from you to get motivated again...very cool book! As the knitting goddess Ms. Yarn Harlot has stated so many times, "Swatches lie!" And after experiencing that exact statement on a sweater that took me a LOOONG time to knit, I not only swatch once I swatch several times on different size needles AND triple count the stitches to be absolutely sure I have the closest possible gauge. Hopefully I will not encounter a swatch that is a chronic lier. Double-knitting has been on my list of techniques to learn for a while. Thanks for endorsement! I have this book too and just have to work up the nerve to sit down and try to knit something out of it -- great job on the cup sleeve -- too bad it looks so much like a scarf! 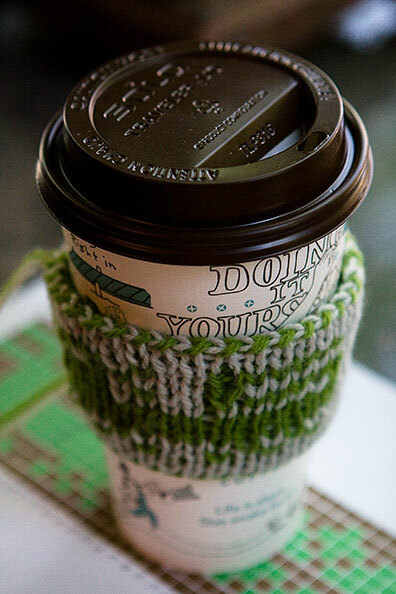 A double knit cup sleeve: That's great idea. Cup sleeves are awesome, and the hats on the cover of that book are brilliant, and Alasdair is my favorite way to spell that particular name. I am utterly charmed. Must go to bookstore! I love that the cup says "Doing it Yourself". Witty. Franklin, if you ever get a chance to take a Double Knitting class with Lucy Neatby - go for it! A coffee cup sleeve! What a great idea!! ZOMG, the world is small. I met Alasdair on the Yahoo double knitting group. Which I founded. *boggles* Now you're using his book. Just wait until the different-on-each-side double knitting takes root in your brain. 14I tell people I'm doodling. as an artist, I don't know what it's going to b until I'm done. I just tell people that I am doodling. As an artist (not an ARTISTE) I dn't know what it'll b until I'm done. This is awesome. I think I've never read a description of a knitting book and thought "I need this". Not just "that might be nice" or something, I was contented with borrowing this great Estonian lace book from the library and so on. But this book I'm gonna get. Would love love love a grown up version of the Middy Sweater on Knitty.Love that pattern so much. I will have to print this out to consult on a daily (if not hourly) basis. Thanks for your wisdom and insight, as always! Like everyone is saying, this craft is really awesome. I absolutely love the yarn and I could not imagine that this artistic crafts are made of it!This is indeed a great idea to start business. I can only look on with envy, and the expectation that i too may one day be there also.